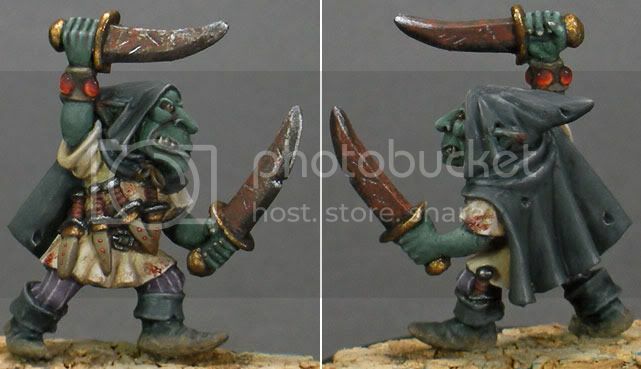 I wanted to go with something a bit different than the typical warm green seen with most goblins, although I didn’t want to stray too far. I decided on a cooler blue-green and also decided to go slightly more desaturated with him since I had not done that previously. The skin was based with RMS Jungle Moss, then lined with RMS Brown Liner. Highland Moss was added to the Jungle Moss up to pure Highland Moss and then progressive amounts of RMS Pale Lichen were mixed in to the Highland Moss. Finally RMS Bloodless Skin was added to the Pale Lichen for the brightest highlights. Finally, I glazed a bit of VMC Deep Yellow to provide some additional color contrast to the face and brightest highlights. The eyes were based with Linen White, then covered with Deep Yellow. The iris was Brown Liner, with a light reflection point of pure white. Finally, the edges were glazed very lightly with VMC black red. I decided at this point to add some visual interest by coloring the ears and doing a bit of complementary shading. The ears were base glazed with VMC Black Red once again as were the shadow creases of the nasolabial folds of the face and on the hands. Finally, the nails and teeth were done with VMC Ivory and then progressively shaded with RMS Stained Ivory and RMS Russet Brown. The shirt was the next on the list; I wanted a lighter contrast to the skin and something that I could dirty up a bit at the end. The shirt was based once again with VMC Ivory, then shaded progressively with RMS Yellowed Bone and Russet Brown. I reintroduced some highlighting with RMS Linen White (not pictured in the next series of pics, but you can see it in the following series with the pants. I elected to go with a desaturated purple for the pants to contrast with the green skintone. It was based with RMS Faded Purple, then shaded with Dusky Grape, followed by Dusky Grape and Brown liner for the deepest shadows. The Faded Purple was subsequently highlighted with a progressive mixture of RMS Snow Shadow. The pinstripes were accomplished with thinned lines of RMS Yellowed Bone. The various accessories were painted next. The gemstones were done in the well described fashion. The basecoat was place first with VMC Black Red. The lower portion of the gems was progressively highlighted with Reaper Pro Paint Bright Red, VMC Deep Orange, and RPP Sunlight Yellow along the lower edge of the gem. At the top of the gem, in the portion kept the darkest, a light reflection point was placed with pure white. The leather portions (wrist band, belt, and dagger sheaths) were done with Russet Brown, shaded with RMS Blue Liner, and highlighted with RMS Driftwood Brown and Driftwood Brown/Linen White for the brightest highlights. The dagger handles were done with VMC Mahogany Brown and shaded with Blue Liner. 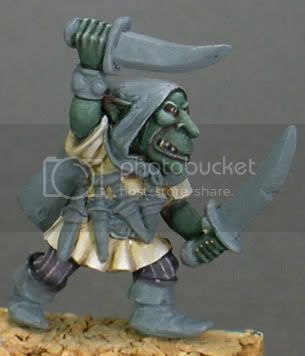 The cape was basecoated with VMC Gray Green, a nice dark gray. It was then shaded with Black along with Blue Liner in the deepest recesses. I then added progressive amounts of RMS Rosy Shadow to the Gray Green to get a progressively light shade of gray. It is important to be sparing in the highlights, otherwise you may push the area from black to gray. As a general rule of thumb with black (or any color really), the color that dominates 50% of the area is what the brain will “see” the color as. I tried to keep the majority of the cape a very dark gray with a large portion of black to maintain the “blackness”. Too much highlighting and it will register as gray. Both the gold and steel metallic were achieved with a technique I refer to as “shaded metallics” inspired by the master Sebastian Archer (Automaton at CMoN). The steel was undercoated with black, based with VMC Gunmetal, shaded initially with GW Devlan Mud, then pure black in the deepest recesses. The Gunmetal was reintroduced sparingly followed by spot highlights with VMC Silver. The golds were undercoated with VMC Mahogany Brown (the photo shows it on the dagger sheaths, but I snapped the pic too early on the sword handles) followed by GW Shining Gold for the basecoat. I then shaded progressively with VMC Smoke and Leviathan Purple. The Shining Gold was reapplied with spot highlights of Shining Gold and VMC Metallic Medium. At this point, Gorerot is much too clean. 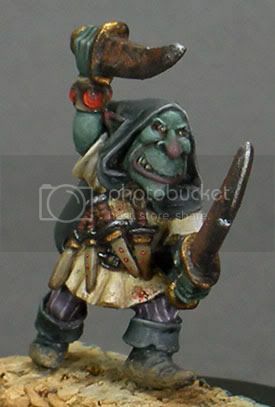 Goblins are dirty creatures and assassination is a dirty business. First off, I needed to rust up the blade quite a bit. This was done incrementally by applying RMS Dark Skin in an irregular pattern over the blades. RMS Rust Brown was then put only irregularly, but over a smaller surface. RMS Clear Orange was applied sparingly, followed by a VMC Smoke was to tone it all down a bit. I added some scratches to the blades with VMC Metallic Medium and pure black for some additional visual interest. Weathering on the tunic and boots was done with MIG pigments Dry Mud and Dark Mud and well as some very thin VMC Flat Earth. The blood stains/splatters were done with Tamiya Clear Red and black mixed together. At this point, I opted to add some additional reds to the face. The nose and lower lip were done with RMS Deep Red and Reaper High Density Entrail Pink. I then added a bit of Highland Moss to the mixture to ease the transition between the reds and the surrounding skin tones. 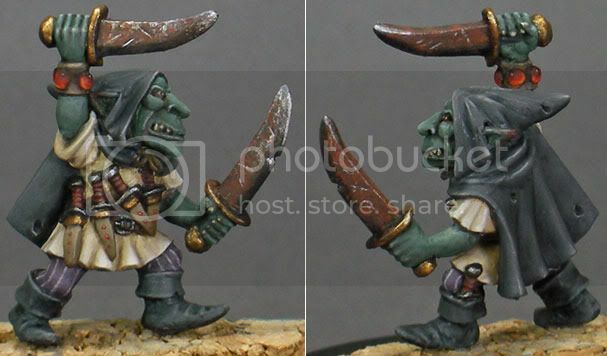 As Gorerot is a sophisticated urban goblin, I wanted to go with a city style base and chose the Microarts Studio cobblestone base. The base was primered entirely in black. 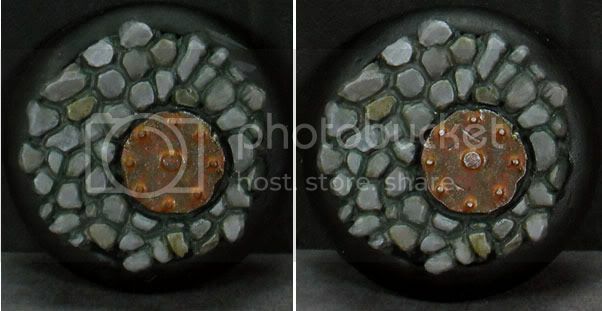 The RMS Stone Colors Triad was applied, started with the darkest shade Shadowed Stone followed by Stone Gray and Weathered Stone. Some variety to the stones were accomplished with a selective washing of the Secret Weapon Armor Wash, followed by RMS Jungle Moss to tie the base to the model, both of which had this particular shade of green. Final highlights were picked out with RMS Leather White. The manhole cover was done similarly to the swords, with a black undercoat, Gunmetal, the Secret Weapon Armor Wash (because it was on my palette; Devlan Mud would work just as well) and finally Silver. The rust was again done with RMS Dark Skin, Rust Brown, and very small amounts of Clear Orange around the rivets. It came off a bit too bright, so the whole cover was washed with VMC Smoke to tone it down. Finally, I added a few scratches and bright highlights with VMC Metallic Medium. As this was a competition piece, I decided to up the ante and do some additional weathering on the cape as well as a bit of freehand. 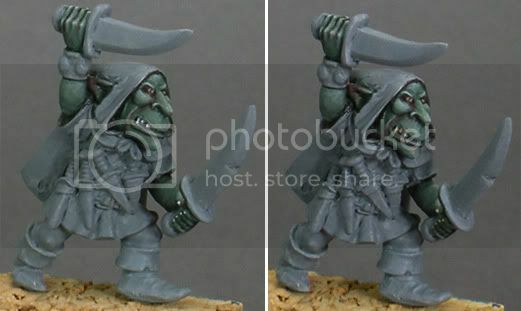 The freehand was a simple line drawn on the hood and bottom of the cloak done initially with VMC Ivory. This color was chosen because it provides good coverage over black and to offer an easier base over which to paint the reds. The reds were done with RMS Blood Red, then highlighted with very thin RMS Clear Red. The recessed portions of the freehand were shaded with thin passes of black to darken the color. The Dark Mud/Dry Mud/Flat Earth combo was applied along the base of the cape over the freehand.